Before I begin with the negative I want to point out that I really enjoyed this movie. As slasher movies go this one is pretty solid. However compared to the first two movies in the series it is a bit underwhelming. There weren't as many surprises as one would expect from a movie like this. The killings and chase sequences lacked the the thrills that makes the viewer jump up. This could be because we don't really care for the characters as we barely know them. The whole interaction between the characters was very limited and felt rushed. The deaths were basic stabbing stuff. Not once did you actually thought OMG, horrible! Don't know about you but you have to have at least one scene like that. Also I think Wes Craven was so right to fear that after the Scary movie series that Ghost Face would not be effective any more. Every time Ghost Face appeared you just couldn't take it very seriously. Granted that might be in large part the fault of the Scary Movie franchise. 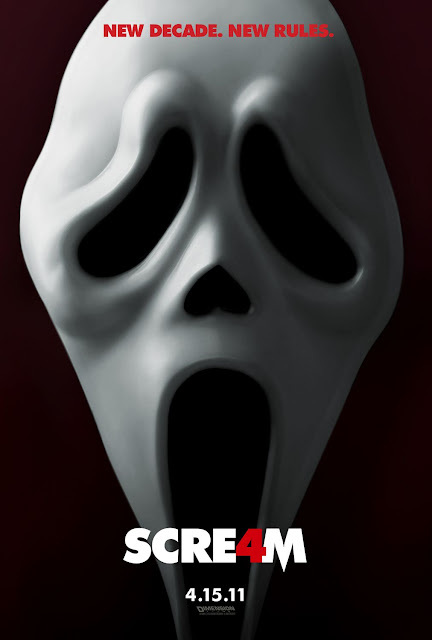 While there were some funny moments it wasn't nearly as sharp as the comedy used in Scream 1. Still I did like the ending very much. Even if more red herrings could made the ending have more impact. Overall Scream 4 still manages to be entertaining and enjoyable as long as you realize it isn't as strong as the first two Scream movies in the series. Noticed how I did not mention Scream 3. Yeah, well, that one was terrible.